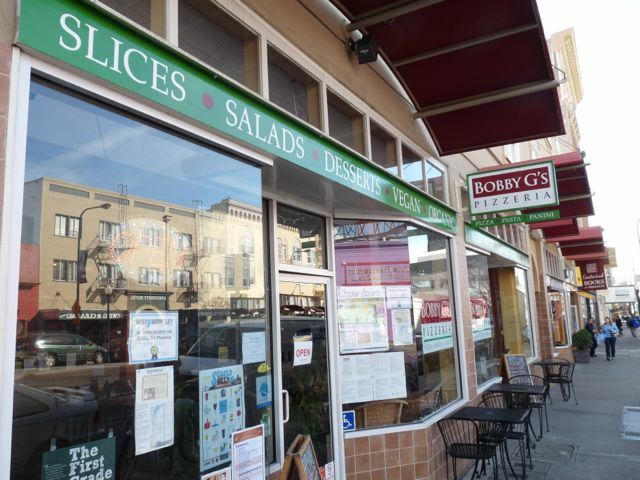 Bobby G’s Pizzeria is a pizza, pasta and panini restaurant in downtown Berkeley… and they happen to serve excellent beer. They pride themselves on making pizza with “organic house-made pizza dough, fresh organic tomato sauce, extra virgin olive oil, fresh whole milk mozzarella, and aged parmesan cheese.” Their eleven-tap beer selection is put together with equivalent care. They nearly always have Russian River’s Pliny the Elder and a Moonlight Brewing beer on, just for an example. They also feature an interesting bottle selection. You can download their current tap list from their webpage. Since they are so close to the locally made beers at nearby Triple Rock and Jupiter, Bobby G’s is an easy add-on to a visit to Berkeley. It has a bit of a sports vibe with multiple TVs tuned to local sports or any other sport if no local teams are playing. Extras: Families come here, so bring the kids. Exit the downtown Berkeley BART station via exit B1, and walk north on Shattuck (towards distant hills) to University, then turn left. Find Bobby G’s several doors down on the left. of Bobby G’s location from Berkeley BART.